What do I do with my catch? Our basic complimentary services include cleaning, filleting and bagging of your catch plus one free bag of ice. For $2.50 per lb (weighed whole at the dock) we can vacuum pack your fillets. We can usually process your catch on the spot and have you on your way within an hour. However, due to staffing limitations, we may require up to a 24 hour turn around time for any processing. Fillets may be picked up during our office hours (12:30 – 2pm Mon-Sat) or shipped to your home via FedEx. Additional shipping and handling fees will apply. Can I have my salmon smoked? We partner with a local smoke shop for this service. For $35 we will deliver your fillets to them for processing, (or you can take them there yourself, about a 40 min drive from our marina). Additional smoking, processing and shipping fees will apply and are payable to the smoke shop via credit card. A warm jacket and layers of clothes, lunch, sunglasses, sunscreen, camera, and rain coat, and rain boots. Bring it all, we have plenty of storage. What if there is more than 6 in our party? We operate 2 charter boats which enables us to split larger parties (greater than 6) for comfort & convenience. Can I bring my dog? No! Can we bring a cooler? Absolutely. Stuff it with as much food and drink as you can. Can we bring alcohol on board? Yes, but we strongly caution against over consumption. Will we see whales on fishing trips? Possibly, especially in the summer months. Can my kids or grandma go for free if they don’t fish? We charge by the seat and are limited by our permit to 6 people. A person occupying a seat but not desiring to fish would take the place of a paying fisher person, therefore we charge a full person rate. Yes we do, so please ask us about them. Can we get off on one of the Islands to explore? Can we go whale watching or or sight seeing? See our “combinations trips” the drop down menu. The Pacific Northwest Marine Activities Association lists many other recreational activities available in Anacortes. Is there a fish guarantee? We are very good at what we do, but we cannot make the fish bite or stay on the hook. Is there a whale guarantee? When it comes to finding whales, we are well connected with the local whale watching community, but we do not guarantee a sighting. Can I smoke? Though pot is legal in WA State we operate in Federal waters and therefore marijuana is not legal to possess or smoke on the vessel. Cigarettes are allowed but we expect customers to be respectful of others on the boat. There are 5 species of salmon in the Pacific Northwest. The current run will determine which type we’re targeting. 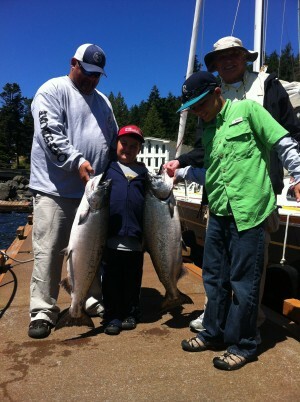 If bottom fishing, May and June, we target halibut and lingcod. Rain never stops us. It’s Washington! What happens if it’s windy? We will cancel the trip with a full refund if the captain judges that it’s not safe to go. How do I get to you? Please see Getting Here.